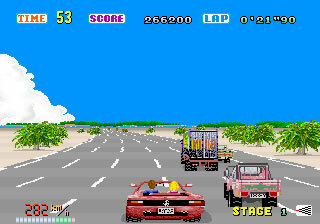 Out Run was a cheesy driving game released in arcades by Sega in 1986. Players took control of a Ferrari convertible with their blonde bimbo girlfriend in the passenger seat next to them and had to race through various checkpoints within the time limit and outrun the police to progress to further stages. With visuals reminiscent of Miami Vice this was one of the first racing games to give a real sensation of speed. It was also one of the first to switch from a top-down birds eye view to a camera position behind the car. Out Run was hugely popular in the arcades and four types of cabinets were released: two stand up models, a basic sit down model and a super deluxe sit down model where you were basically sat in a mock car which moved around in a limited fashion and was hugely exciting when I was a kid. All of them had a steering wheel, and two pedals for acceleration and braking as well as a gear stick. At the time the 3D effects were hugely impressive and allowed for a very fast frame rate which really gave the player a feeling of extreme speed as they zoomed through various colourful backdrops including a beach front road, a desert road and a passage through the mountains. The feeling of speed was attained by what Sega called their Super Scaler technology and Out Run was only the second game to utilise it after the classic Space Harrier. Crashing in the game was another visual treat as your car would be spun into the air spilling you and the missus onto the road below. The game featured sixteen routes in all but a branching system allowed the player to choose which way to go at each stage so you only ever played through five to complete the game. If you successfully made it to the end you’d be rewarded with a comical cut scene animation, there was one for each of the possible endings. My favourite was the driver being thrown into the air triumphantly by the crowd only to be dropped when they all got distracted by a woman in a bikini. The most famous song in video games ever? Possibly. The cheerful colour packed graphics were accompanied by a choice of cheesy music tracks which you could select via the radio in the car, like an early version of the GTA system. 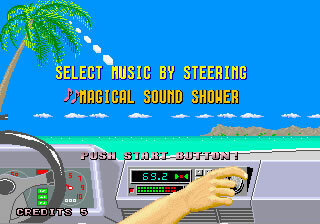 Choices were the wonderfully named Magical Sound Shower, Passing Breeze and everyone’s favourite Splash Wave. The simple addictive game-play was what really made this game and it definitely took racing games in a new direction with several cleverly designed game mechanics. Apart from the challenge of racing against the clock and avoiding multiple hazards the idea of branching routes and selectable music tracks were both new at the time and are now racing game standards. It was a hugely popular game and was ported to all of the home systems from the PC and Commodore 64 through to the Sega Master System and then the Mega Drive. The best of the bunch was the Mega Drive port released in 1991. There are even ports for the Playstation 2 and a number of sequels were released, the last one came out in 2006. Out Run was an addictive game and the high difficulty level and various routes and endings gave it a good replay factor. You could easily pour mountains of cash into the arcade machine version and many kids did. The fit-inducing visuals, blocky graphics and terrible pop-up make this look very dated nowadays but the simplistic game-play is still quite addictive, the music is great and it’s tough not to love the super cheesy eighties style. In terms of overall recognition, I’d wager Super Mario Bros. 1’s “Overworld BGM” is the most popular piece of video game music ever made. Do the Mario! I dont agree that the graphics look blocky or dated. It was then and still is a stunning racing game. Nothing has come close to being as much fun. Sod the realistic handling and physics you get these days and give me the pure simplicity and adrenaline pumping enjoyment that OutRun gives! !